This fruity red blend is an unusual marriage between iconic Italian and Spanish varieties and it really works. Sip Erasmo Barbera Garnacha on its own or enjoy it with a wide variety of food – its fresh and lively fruit-forward style is very moreish. This wine is a medium ruby colour and has a delightfully pronounced nose. Aromas of red fruit, like strawberry jam, raspberries and red plums, together with rhubarb, intermingle with a subtle herbal note of liquorice or dill. As the wine opened, a touch of mushroom and earth became apparent. The wine is dry with medium (+) acidity, medium (+) ripe but coarse tannins, medium (+) body and high alcohol. The mouth is lively with lots of red fruit and a chalky or even slightly earthy texture adding interest. The finish is medium (+). Erasmo Barbera Garnacha is a food-friendly wine that will work well with a wide variety of different dishes – you may want to try it with oven-roasted vegetables drizzled with olive oil, pizza, roast pork, chicken or dishes made with firm types of fish, like cod or hake. Barbera is from Italy – most especially Piedmont – and, until recently, was often seen as making an everyday kind of wine that was a bit on the tart side. But then, just as has been discovered with other varieties, they found that if the yields are controlled, so each vine just produces a moderate amount of grapes, it can actually make some great wine. So Barbera has been experiencing a Renaissance lately. It grows well in warm conditions and makes wines with high acidity, low tannins and fruity flavours which can range from black fruit like blackberries through to red cherries. When it’s aged in oak – not the case with this wine – it gains more tannins, becomes rounder and develops aromas and flavours of plums. Garnacha or Grenache, as it is called in France, is thought to come originally from Spain, where it is widely planted. As it too likes warm temperatures, it’s also widespread in some of France’s warmer regions, like the southern Rhône – the legendary Châteauneuf-du-Pape is largely or even wholly Grenache. The aromas and flavours of Grenache only reach their best when the grapes are very ripe and have a high level of sugar. High sugar means high alcohol and it also means that the acidity will have declined. So Grenache wines generally have lowish acidity and high alcohol but lots of lovely fruity aromas and flavours. Erasmo Barbera Garnacha is a very unusual blend and I’d say it’s a genius idea to combine two warm climate varieties, one that is known for too much acidity and moderate fruitiness with another than is troubled by insufficient acidity but jam-packed with lively red fruit aromas and flavours. 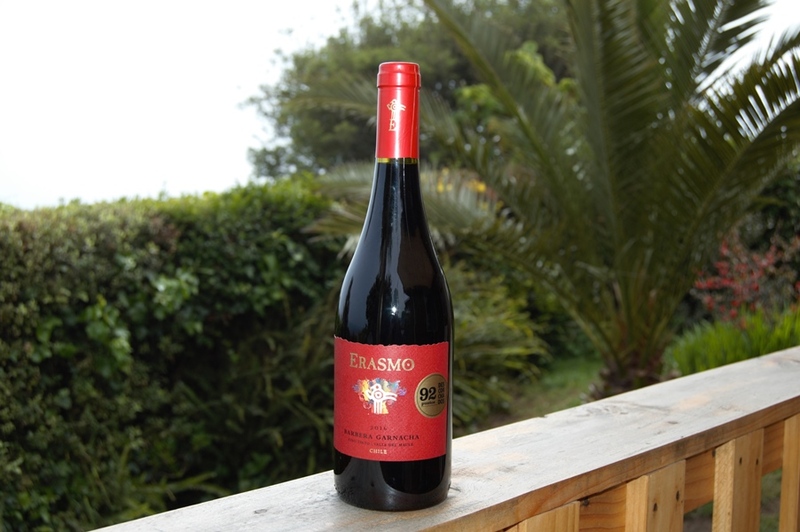 Erasmo grow their grapes following organic principles. It seems the quantities of each type of wine vary from year to year and in 2016 were 70% Barbera and 30% Grenache. Half of the grapes were co-fermented and the other half were vinified separately, in both cases in stainless steel tanks, so the winemaker’s intention would be to retain the fresh fruitiness of the grapes and avoid letting the wine be spoiled by contact with oxygen. Grenache is particularly prone to fading young if it has been in contact with too much oxygen or just left too long in the bottle. Having been disappointed recently by two different Grenache wines of which I had high expectations, I can speak from experience on this. My top tip: if you buy a wine which is pure Grenache or a blend containing a lot of Grenache, like this one, unless the back label suggests otherwise, don’t keep it for a rainy day. Drink it and enjoy it young, while it’s deliciously fruity. In Chile, Vinoteca stocks this wine. The company website details stockists in other countries around the world.